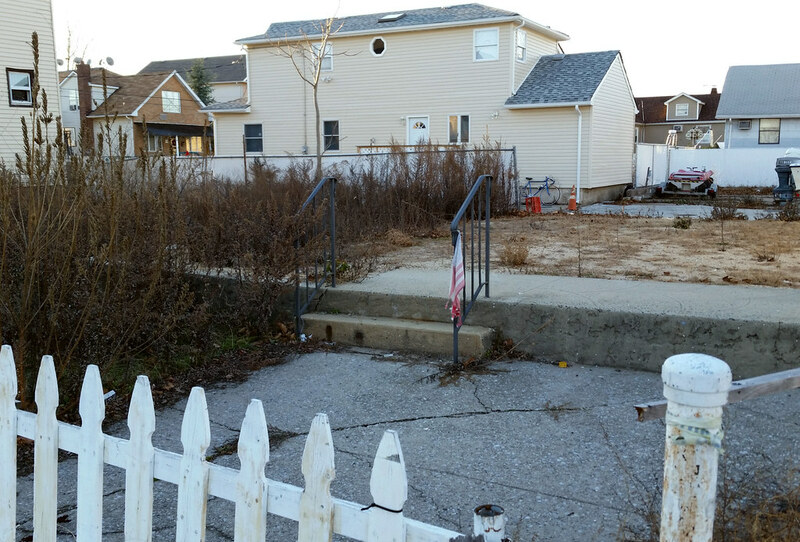 The house that once stood here was demolished after being wrecked by Hurricane Sandy. The owners of this property, Sheila and Dominic Traina, also lost other buildings in the neighborhood, including their own home at 67 Cedar Grove Avenue. A mini-controversy ensued when Allstate used footage of their destroyed house in a back-patting post-Sandy commercial even as the insurance company was denying the Trainas what they believed to be fair compensation for their losses. After the wreckage of the house was cleared, the flag-painting Staten Island artist Scott LoBaido installed a sculpture on the lot entitled Waiting, which "symbolize[d] the frustrating world of Island survivors of the storm. After lives lost, homes damaged or demolished, possessions ruined, most find themselves in a bureaucratic limbo, waiting for help that never seems to arrive."